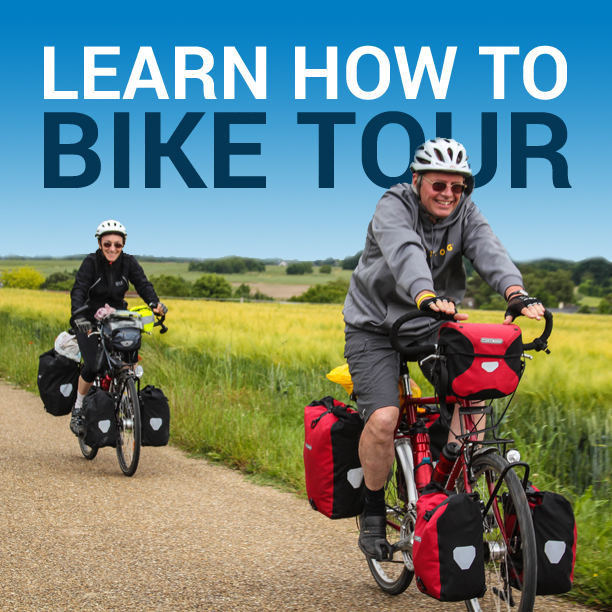 IMPORTANT: It’s highly recommended that, in addition to watching all 14 videos in this course, you also use “The Essential Guide to Touring Bicycles” to help you find your ideal touring bicycle. 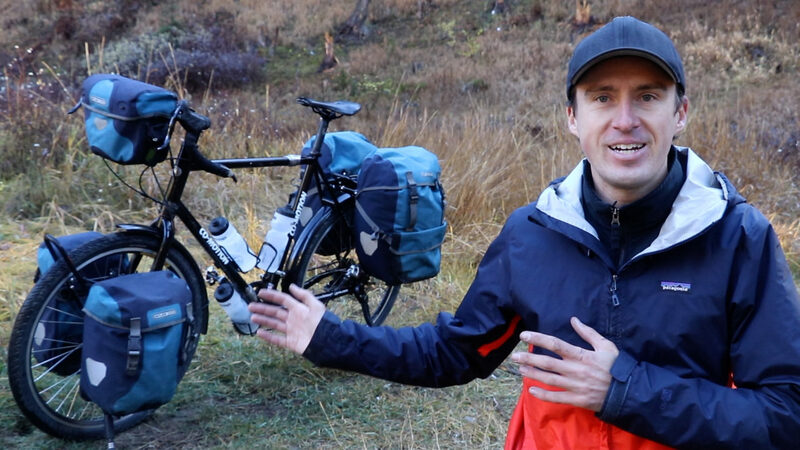 Hello, my name is Darren Alff… and I am the Bicycle Touring Pro. You’re going to learn what a touring bicycle is and how a touring bicycle differs from the road and mountain bike models you might already be familiar with. Then you’re going to learn which characteristics you should look for in your new touring bicycle. In this section of the course we’ll talk about the frame of your bike, the wheel and tires, the handlebars, the shifters, the gearing, the saddle, the pedals, methods for carrying your equipment… plus a whole lot more. After that we’ll discuss the actual buying process. I’ll share my secrets for getting the best deal on your new touring bicycle; we’ll discuss how to find the right size bicycle for your body type; and I’ll share the entire process involved with purchasing a new touring bicycle, (because, unfortunately, it isn’t always as straightforward as you might think). Finally, you’re going to learn how to equip your new touring bicycle for life on the road. You will learn how to take any basic touring bicycle, like it comes from the dealer, and then add all the extra parts and pieces that we are going to discuss throughout this course and put them all together into a finished bicycle like this, so that, in the end, you’re equipped to take off and hit the road on your own bicycle touring adventures. The goal of this course is to educate you so you can go out on your own and purchase the best type of bicycle for your specific needs; so you don’t waste your money purchasing a bicycle that isn’t suited for the type of cycling you ultimately wish to conduct; and so that, in the end, you have a touring bicycle that you can use to conduct your own incredible bicycle touring adventures anywhere in the world. If that sounds good, then please continue to the next video in this course… and let’s discuss the various types of touring bicycles, because as you are about to discover – there are several different types of touring bicycles designed for several different types of bicycle touring… and the bike you end up purchasing is going to be very much determined by the type of bicycle touring you wish to conduct. BICYCLE INFORMATION: The touring bicycle featured in this video (and throughout most of this course) is my Co-Motion Cycles Pangea touring bicycle. In addition to this bicycle, you will also see the Chumba Ursa 29+ and the Co-Motion Cycles Siskiyou touring bicycle used in some of the videos throughout this course. I personally own all three of these bicycles and would highly recommend them all. Got questions or need 1-on-1 assistance with finding your ideal touring bicycle? Sign up here for a private coaching call with the Bicycle Touring Pro and get your questions answered straight away! This entry was posted in Bicycle Touring Pro Articles, Bicycles, Featured How-To Articles, Main Articles, Main Featured Articles, Touring Bicycles, Uncategorized, Videos and tagged best touring bicycle, introduction to touring bicycles, touring bicycle, touring bicycle buyers guide, touring bicycles, what is a touring bicycle, your first touring bicycle.